Happy Hallowe’en everyone. 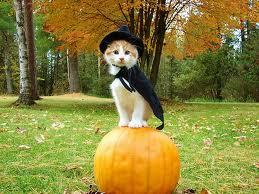 It’s a bit worrying just how many Google images there are of cats in pumpkin costumes…. Yes, I know I’m a day early, but I couldn’t wait to share the spooky trailer for Dark Spell that Floris books have put together here. Dark Spell is definitely a good read for a dark night – in fact I creeped myself out writing some of the scenes in my creaky old house. If any of the pupils in my science class are reading this, prepare to enter Dr Arbuthnottstein’s laboratory of death (I could be bluffing about that bit) tomorrow morning to try an experiment called ‘How much fizz is in a dead witch?’ and find out if the fizz will burn… cue fiendish laughter…..